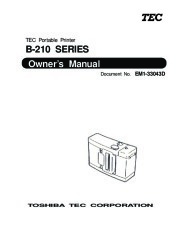 TEC Portable Printer B-210 SERIES Owner’s Manual Document No. 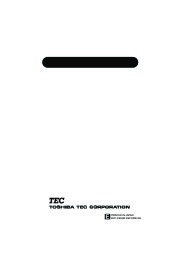 EM1-33043D Table of Contents TOSHIBA TEC CORPORA TION DECLARATION OF CONFORMITY Manufacturer Address : TEC Corporation : 570 Ohi to. Ohito-Cho. Tagata-Gun, Shizuoka-Ken, 41 D-23 Japan declares that following product Product Name : Bar Code Printer model : B-210 Series options : All Conforms to the following Product Specifications Safety EMC : EN 60 950 : EN 56 022 IEC 801 -2 IEC 801-3 Supplementary Information The product herewith complies with the requirements of the Low Voltage Directive 73/ 23/EEC. 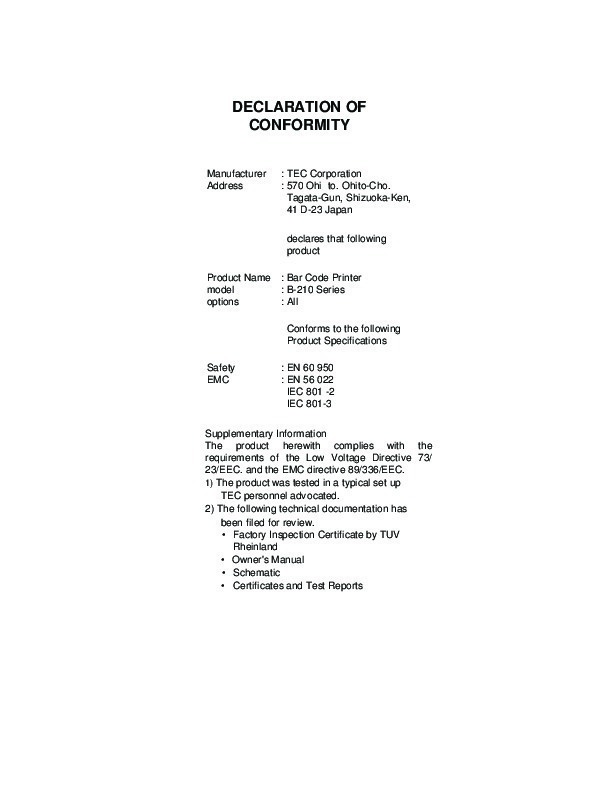 and the EMC directive 89/336/EEC. 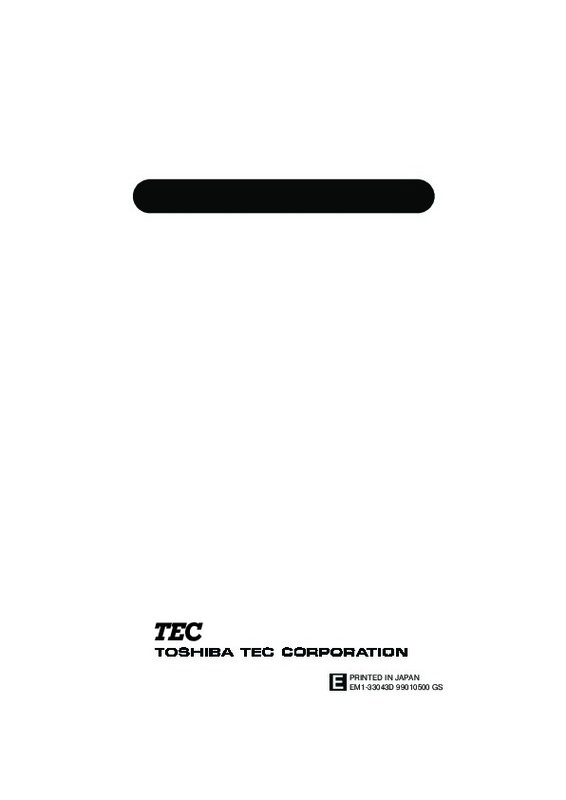 1) The product was tested in a typical set up TEC personnel advocated. 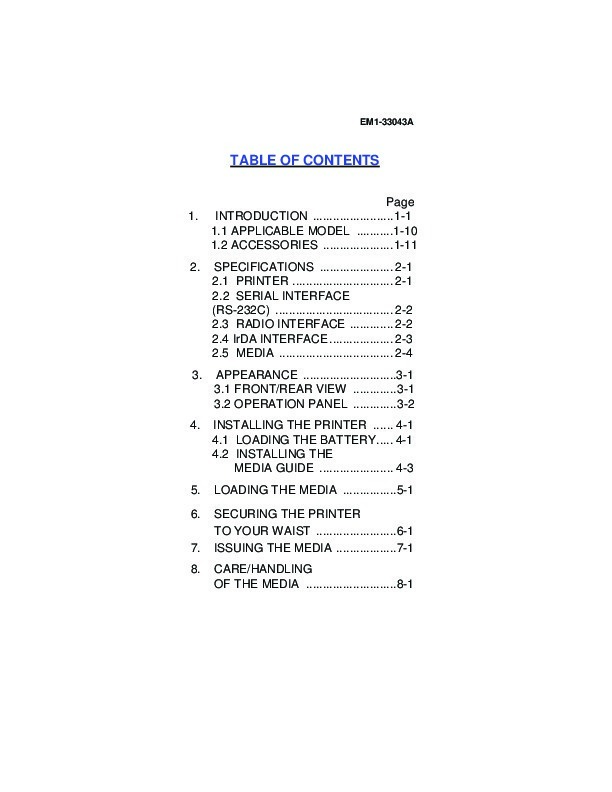 2) The following technical documentation has been filed for review. 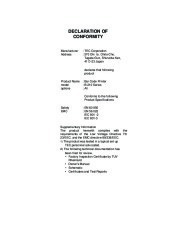 · Factory Inspection Certificate by TUV Rheinland · Owner’s Manual · Schematic · Certificates and Test Reports EM1-33043A TOC 2 TABLE OF CONTENTS Page INTRODUCTION 1-1 1.1 APPLICABLE MODEL .1-10 1.2 ACCESSORIES .1-11 SPECIFICATIONS 2-1 2.1 PRINTER 2-1 2.2 SERIAL INTERFACE (RS-232C) . 2-2 2.3 RADIO INTERFACE . 2-2 2.4 IrDA INTERFACE . 2-3 2.5 MEDIA 2-4 APPEARANCE 3-1 3.1 FRONT/REAR VIEW .3-1 3.2 OPERATION PANEL .3-2 INSTALLING THE PRINTER 4-1 4.1 LOADING THE BATTERY. 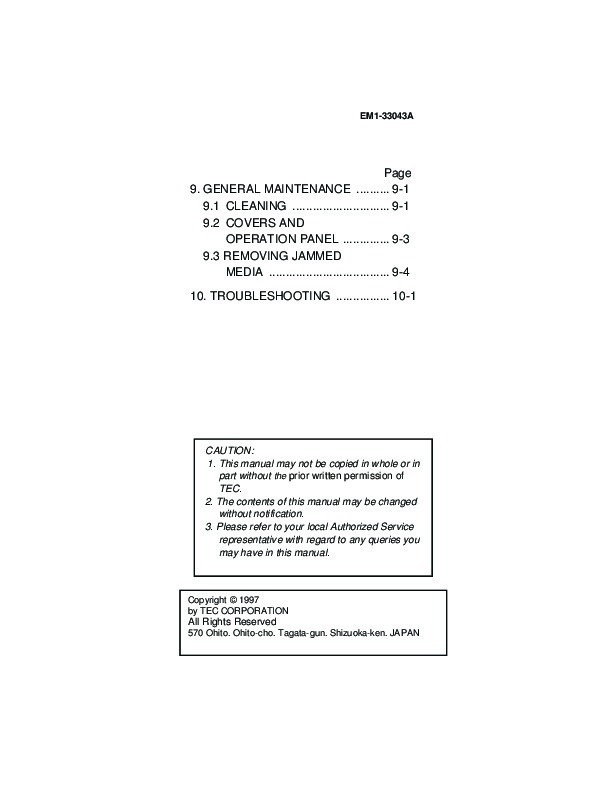 4-1 4.2 INSTALLING THE MEDIA GUIDE 4-3 LOADING THE MEDIA 5-1 SECURING THE PRINTER TO YOUR WAIST 6-1 ISSUING THE MEDIA 7-1 CARE/HANDLING OF THE MEDIA .8-1 1. 2. 3. 4. 5. 6. 7. 8. 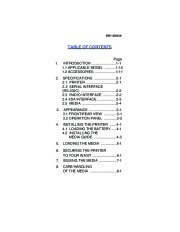 EM1-33043A TOC 1 Page 9. GENERAL MAINTENANCE 9-1 9.1 CLEANING . 9-1 9.2 COVERS AND OPERATION PANEL 9-3 9.3 REMOVING JAMMED MEDIA 9-4 10.